Fluval Chi Review - Is This 5-Gallon Fish Tank Worth It? Find Out Here! Fluval Chi Review – Is This 5-Gallon Fish Tank Worth It? Updated on 2016-11-04 – The Fluval Chi II is a beautiful glass 5-gallon tank and is by far one of my favorites. Don’t get me wrong, there are a few things that I think need improvement (which I’ll get into in a minute), however as a whole I think it is a great tank. Keep reading for our Fluval Chi Review. 1. As I mentioned already, the Fluval Chi fish tank is absolutely stunning and on top of that, it doesn’t take up too much room so it can go pretty much anywhere (bedroom, kitchen, bathroom, living room, etc.). It also comes with almost everything you need to get started with betta fish: aquarium, filter, LED lighting, water conditioner, etc. The bubbling sound that the tank makes when the water spills over is also extremely relaxing, which makes the tank even more pleasant to look at. At least in my opinion. 2. I like the way they designed the filtration cube because you don’t have to take it out to change the filter. All you have to do is rotate the cube and open the door underneath to remove and replace the filter. It definitely makes cleaning the aquarium that much easier. 3. The LED lighting is also very powerful compared to other aquariums around the same size, which is great if you are planning on growing live plants in your tank. Ok, now for the downsides. Earlier I said that the tank comes with almost everything you need, except for a heater. If you are new to the betta fish world, then one thing you need to know is that it is extremely important to have a betta fish heater if you want your betta to survive the long haul. So important that I wrote a complete blog post on it – see Importance of Having a Betta Fish Heater. If/when you buy this tank, just make sure you buy a heater to go with it. Another thing is that the water seems to evaporate a little bit more with this aquarium. I don’t think that’s just the case with my set up because other people have been commenting about the same in different forums. Not a big deal, just make sure you keep an eye on it and fill it up when it gets too low. Overall Opinion – This Fluval Chi is a fantastic selection and one of my favorites for holding bettas. Not only is it efficient and very easy to care for, it’s also has a very elegant design and looks great just about anywhere. Updated on 2016-11-04: I’m in the process of updating some old blog posts/reviews that I made a while ago. In this case, I added more emphasis on the importance of purchasing a heater when you decide to buy this tank. I also updated the ratings to be more accurate. I originally had the “Size” factor as a 3.5, however this was an error and it has been upgraded to 4.5 stars, as it surpasses my minimum standard of 3 gallons for a betta fish. 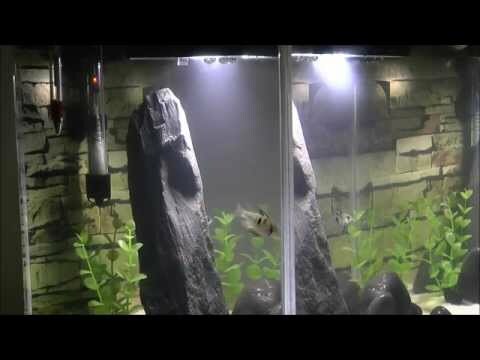 We hope you found this Fluval Chi Review useful. Before you leave, please check out our SHOP page for amazing deals on tanks, decorations, supplies and more! Interested in other tanks? Check out our other fish tank reviews. Sounds exactly what I needed for 1-2 Betta fish. Thanks for the article. No problem at all. Txs for the feedback. Any ideas on how to house two male bettas in this tank? If it’s not possible, it’s not the end of the world but I’m trying to house four males without my house looking like it’s a pet store. Hi Sara. Sorry to hear about your fish problems. For your first question, I always recommend a heater, even if the room temperature is high enough. Mainly because you can’t predict a sudden shift in temperature (even if it’s a few hours) and bettas don’t react that well to drops in temperature. The heater would be a good backup. As for the number of bettas, I would stick to only one. Bettas are extremely territorial. 5 gallons is not enough for 3 bettas. However, if you are going to try 3 anyways, make sure you get them all young and they have to be all female. If you add one male to the mix, it’s not going to end well. I hope this helps.